? Ruggedized Features: IP65 allows you to performance scanning even in environment like a desert storm in Sahara or the monsoon of rainforest South Asia region that has high humidity. 1.8m drop resistance lets it safely complete its mission with consistent quality and performance.
? Precision & Efficiency: Rapid reading speed. Three times the data transmission speed comparing to other scanners in its class.
? 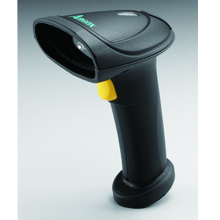 Excellent performance: Processing up to 4mil resolution barcode readability. Support all type of electronic device, such as mobile phone, tablet and LCD display.
? Scanning enhancement: Patented Cross-line laser targeting indicator reduce user fatigue and it will improve your efficiency.